Contest • David Gillespie's story is brought to life by his son, who wins PTA award. | Courtesy Photo From left, National PTA President-elect Laura Bay, Utah student Eric Gillespie and National PTA President Otha Thornton. 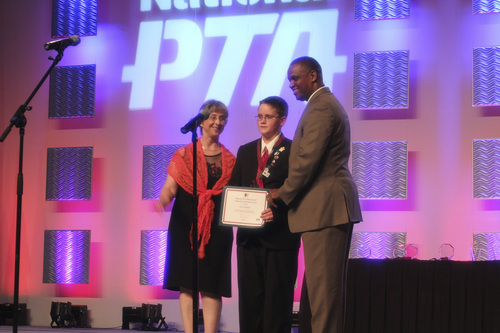 Eric was honored at the PTA national convention in Texas in June for his award-winning video about his father. This panel is made up of scenes from a video that fifth grader Eric Gillespie made about his father, Dave Gillespie. 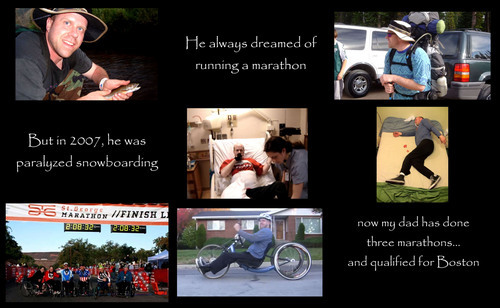 The elder Gillespie was paralyzed in a snow boarding accident in 2007 but has come back to compete in marathons. A screen shot of Dave Gillespie from a short move his 10-year-old son Eric made. 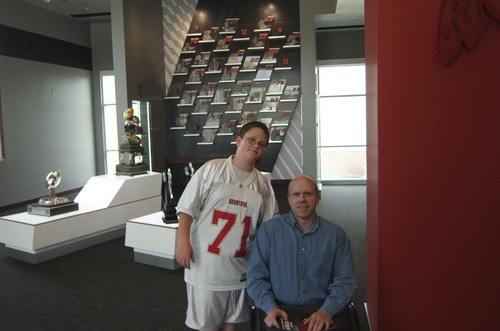 (YouTube video) | Courtesy Gillespie Family Eric Gillespie and his dad David Gillespie visit the Ute football training facility this summer. Eric's video about his father completing marathons despite being paralyzed won a national award in the PTA Reflections contest this year. | Courtesy Gillespie Family David Gillespie and his son Eric Gillespie visit the Mount Nebo Scenic Byway in 2011. Eric's video about his father completing marathons despite being paralyzed won a national award in the PTA Reflections contest this year. 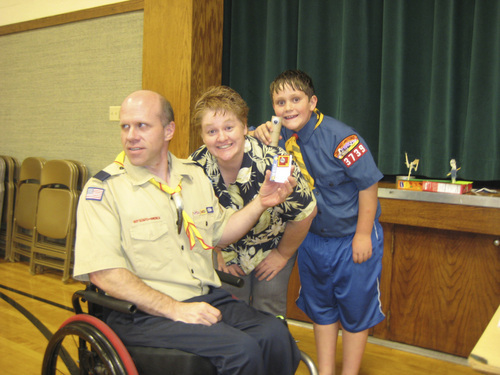 | Courtesy Gillespie Family David Gillespie, Eden Gillespie and their son Eric Gillespie pose after Eric received a Cub Scout award in 2012. Eric's video about his father completing marathons despite being paralyzed won a national award in the PTA Reflections contest this year. When Eric Gillespie asked his dad to be the star of his film about inspiration, his father was hesitant. "I was very skeptical anyone would find my story inspirational," David Gillespie said. "I&apos;ve only done a few marathons." His son, then in fourth grade, knew better. 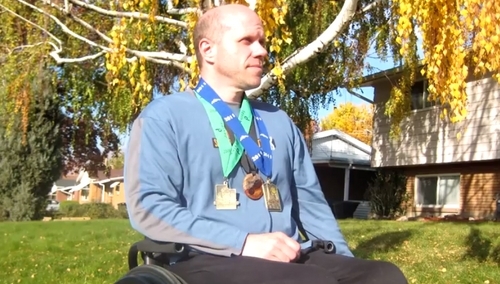 David didn&apos;t run those marathons  he completed them via handcycling despite being paralyzed from the chest down. "He does things other people wouldn&apos;t even try doing," said Eric, who is 10 and will be a fifth-grader at Bountiful&apos;s Valley View Elementary in the fall. "He&apos;s just pulling through it." Eric&apos;s vision paid off. His video recently won one of seven top spots in the nationwide PTA Reflections contest, which drew nearly 300,000 entries in six arts categories from kids in preschool through 12th grade. Eric&apos;s video won Outstanding Interpretation in Film Production, topping entries from all age groups. "He still believes in his dreams and he doesn&apos;t give up," Eric said of his dad, who was paralyzed in a 2007 snowboarding accident. 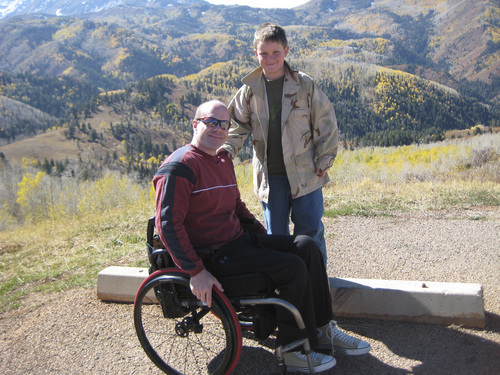 At the time, David was training to run his first marathon, working as a researcher at Huntsman Cancer Institute, and, with his wife Eden, raising Eric and two older sons, one of whom is mentally and physically disabled. Then on Christmas Eve, he was snowboarding at Brighton Resort when his snowboard caught on something. He flipped backward into a tree. He was paralyzed from the chest down, in addition to breaking his back, pelvis, shoulder and clavicle and puncturing a lung. He spent four months in the hospital suffering from "every complication of a spinal cord injury most people can have." Lying in bed then, David didn&apos;t dream of completing a marathon. "I was more worried about if I&apos;d even be able to sit up or get back to work," David said. He spent the next year re-learning how to live his daily life. Slowly, he adjusted. The Huntsman Cancer Institute got him an electric wheelchair that allowed him to stand during the day so he could still work in the lab. He also joined a therapeutic outdoor recreation program where he saw other paralyzed people staying active in sports. He soon decided he&apos;d like to try again to train for a marathon  this time with a handcycle. "I liked to prove to myself that I could still do something like that and also, I guess, to show my son that life&apos;s going to throw you a lot of curves, but you have to step up to the plate and hit them," David said. In 2009, he finished the Salt Lake City Marathon. Since then, he&apos;s completed two others. The lesson wasn&apos;t lost on Eric. The roughly two-minute video, titled Dream Walking, opens with the phrase, "If you can believe it … you can dream it … You can live it." It shows photos of David before the accident before flashing to a picture of a red medical helicopter perched atop a snowy mountain. A creative sequence follows: Over two days, Eric and David used stop-motion filming to show David&apos;s legs moving as he sleeps, as though he were running in his dreams. Then it cuts to reality: David powerfully churning a handcycle toward his goal. The video ends with a photo of David wearing his three medals from the three marathons he&apos;s finished. Liz Zentner, Utah PTA president, said she was impressed when she first saw the video, especially by the stop-motion filming. "It was so interesting to hear how he did it," Zentner said. "I thought, &apos;What a smart little kid.&apos;"
Eric was among 11 national Reflections winners from Utah this year in dance choreography, film production, literature, music composition and photography. "Shocked" to be one of the seven Outstanding Interpretation winners, he traveled to Austin, Texas, for the Annual National PTA Convention in June. Ten additional Utah students won national recognition in their age groups, placing a Utah winner in five of six categories: dance choreography, film production, literature, music composition, photography, and visual arts. Award-winning works will be posted on the national PTA web page in August. Beginning in January, they also will be shown in the annual Reflections Art Exhibition in Washington, D.C.